First, there were full-time RVers. Then #vanlife took the scene. And now overlanding–typically referring to long distance travel over a long period of time, often in an SUV–is all the rage. There are a plethora of ways to get around the world, and minimalism tends to tie into all of them, but perhaps never quite so extreme as with folks like Ramsey and Heather Ferrie, a couple of 30-somethings living out of “The Great Escape,” their Ford Escape SUV, along with their two rescue dogs Lillee and Kluane. We’re a couple of millennials who realized how amazing life is and want to make the most of it. She says that traveling with their dogs is a win for both the humans and canines. 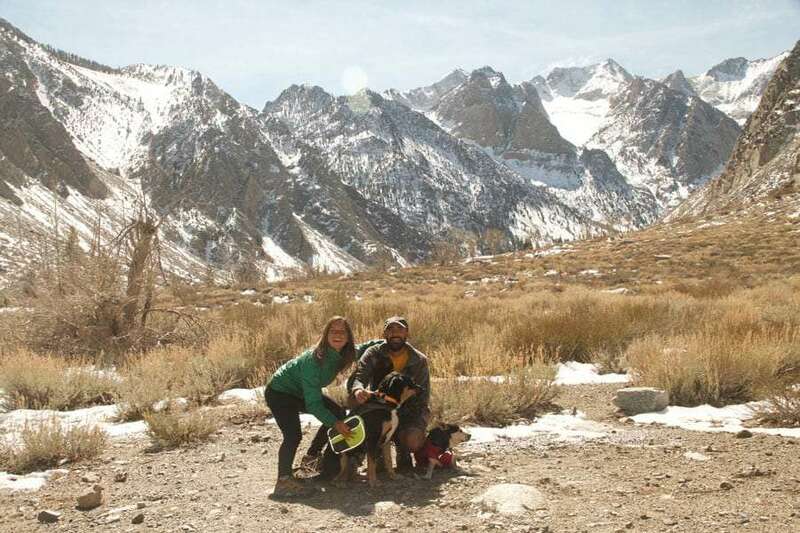 “It fills us with joy to see how happy they are to explore and spend every day with us.” Aside from a few mishaps–Lillee puking into Heather’s hiking boot or Kluane finding himself in a showdown with some cacti–they couldn’t be happier with their decision to travel with their pets. To prepare for roadlife, they first simplified their former life in general. “Living with less meant we could save money to put towards paying down any debt and limit monthly bills. After that, any extra we made from working could go into savings. Now, our bills consist of just one cell phone and basic vehicle costs. The only other money we need is whatever it takes to cover food and gas. These are variable costs, so we can judge from month to month how much fits into the budget. We also strive to keep these low by supplementing our food with foraging and by strategically choosing ingredients that make more meals for the price.” She wants to clarify that they were not rich, and that this life is not solely for the wealthy or the retired. The couple now lives on a mere $6,000 a year, and they replenish their coffers with one seasonal job every year. Heather teaches courses online to this effect, and any money above that number goes into savings, just in case of some future unforeseen emergency. She’s also been working on comparing a traditional “stick n’ bricks” lifestyle with the one they now lead. “We estimated high for us and were very conservative for the other lifestyles, just to be fair,” she tells. It’s clear that she’s proud of the way they’ve carved their own way in life, and rightfully so. Of course, many of us who live on the road full-time still work and find a way to make cell reception connectivity to the web and solar power work for us, but there are certainly times when it’s necessary to compromise on location in exchange for sun and cell, and of course…we’re working much more often than one seasonal job a year or so. Check out Heather & Ramsey’s YouTube channel for everything from tips on how living out of an SUV works to favorite destinations. Part of this money-saving expedition is, of course, boondocking, i.e., living off grid in the multitude of free camping that’s available in the United States. They owned their SUV before hitting the road, and so it seemed the natural first choice of a home to do so in. After that, she mentions the Pacific Northwest. “We absolutely love the Cascade volcanic range, the thick old-growth forests, and dramatic coasts of the PNW. We got engaged and married in the North Cascades on a high alpine meadow hike.” The cost of their wedding? $14 USD. The story of a young scientist, his ax, and a 5,000 year old tree. Like many vandwelling families or even RVers, the couple laughs a bit when asked about how they “fit” into an SUV for a home, and admits that there is very little time spent inside of the Great Escape. “We don’t spend all day in it! We’re only really in it when we’re sleeping. Otherwise, we’re out doing what we love, typically hiking. We sleep in the SUV camper when we’re in town but prefer to tent out when we’re in the wilderness. The couple provides campfire recipes, like this one for Rugged Roasted Chicken n’ Sprouts, on their website, Paradise on Pennies. Some folks who set out to live on the road have a goal in mind, to spend a year traveling the national parks, for example. “Obtaining this lifestyle was the goal,” Heather explains. “Now, we just wish to continue as long as we can. Our primary goal is happiness. This lifestyle has given us all the ability to live wild & free and spend our time together rather than working life away. We love the adventure and learning along the way. Musings on Mexico, half way through a yearlong adventure starring a bunch of hippies, their kids, and a VW Bus. The 100% 411 on choosing a truck camper for full-time traveling and overlanding. The different styles, pros, cons and real world examples from a couple who has done it for years. What to expect from Belize, from cost of living to the best places to explore, tailored specifically to overlanders.